the Grand Prize winners of the 2016 ASHG Teen Gene's Video Challenge! "We're so proud of Beryl and Cindy's achievements!" said Toby Walker, Head of School. "This is indicative of the passion for learning that BASIS Independent schools instill in their students." 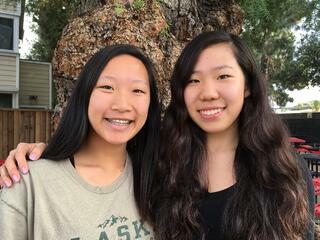 Beryl and Cindy said that they became "obsessed" with tinkering, learning new skills, and making the video "perfect." "We were shocked!" said Beryl and Cindy. "At first we thought it was a hoax that we won."Ms. Murthy, Beryl and Cindy's Biology Teacher, said that "It is an absolute pleasure to mentor and teach students like Beryl and Cindy. We started out the year in AP Biology learning biotechnological techniques and applications. What sets Cindy and Beryl apart is that they are not afraid to push the boundaries and think out of the box." Murthy shared an article on CRISPR/Cas9 for Gene Editing with Beryl and Cindy to help guide and inform them. Murthy said that Cindy and Beryl "put together a captivating video" that "tackled an advanced topic and made it understandable for their peers." Viva Zhao, Biology teacher, said that she "wasn't surprised" that they won. "Beryl and Cindy are constantly raising the bar of excellence," said Zhao. "What makes them special is not that they are smart, talented, and hard working but that they are risk takers and not afraid to go the extra mile and push the limits." Entrants were asked to submit a 3-5 minute video that describes any current application of genetics and explains how it works. After the videos were reviewed for appropriateness, ASHG members were invited to view the entries and use a predetermined set of judging criteria to vote for a winner. First-place winners Cindy X. and Beryl Z., whose clay stop-motion video described how CRISPR genome editing works, will share a $1,500 monetary prize. In addition, they will participate in a video chat with Rick Guidotti, an award-winning former fashion photographer and founder of Positive Exposure.